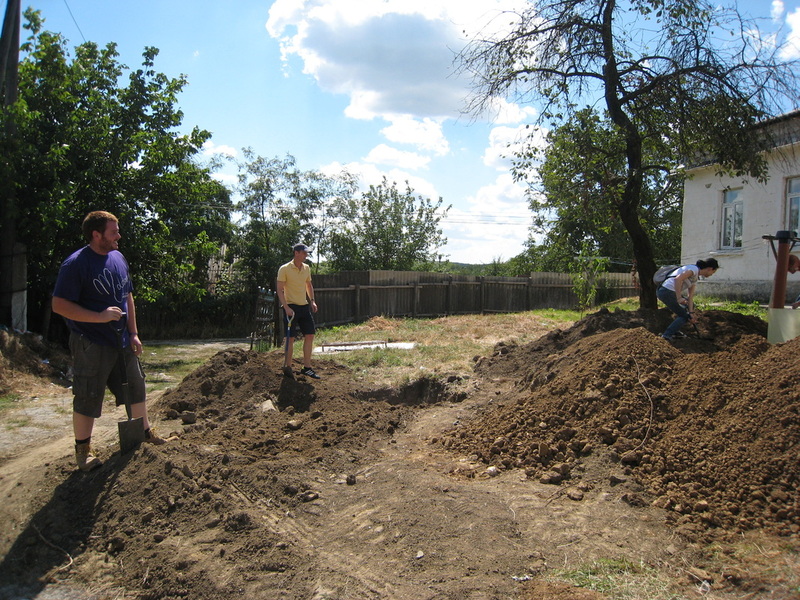 TEECH volunteers have just returned from another successful trip to Moldova, working at the village school in Balanesti. 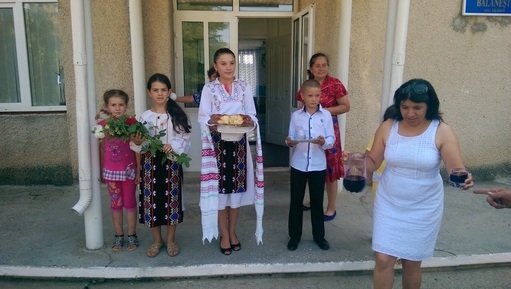 The team traveled for 8 days to and from Moldova and spent 9 days on location. 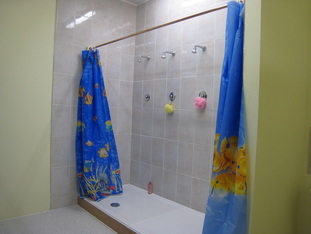 The challenge was to connect running water to a room within the school and create a bathroom for the boys and one for the girls. 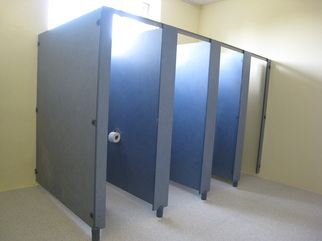 The school had no indoor toilets and just the traditional long drop outdoor 'toilets' prior to the charities arrival. 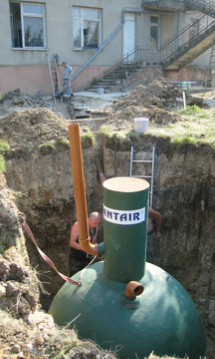 The team also installed a septic tank at the village kindergarten. The children from the kindergarten came to visit us at the main school to thank us by singing and dancing - the children can be seen in the picture above. This newsletter thanks all the donators and suppliers who helped to make the project possible. Without the support and help from companies willing to donate or provide discount, then the project would not have been possible. All our suppliers and supporters are also listed on a seperate page, please click here. The team traveled over to Moldova in lorries loaned by BT Fleet, who also funded the fuel, ferry, road tolls and provided a free service to the charity van before departure, and a coach hired from Galleon Travel. We are grateful to both companies for this key part of the trip, ensuring all the aid and the team arrive at their destination. BT also fund the fuel for the lorries which is a huge benefit. Harbour Shipping of Dover and Neil Bomford are also key players by ensuring we have the right paperwork for customs and a trailer for the articulated lorry. P&O allow the team to travel with a discount and Brentwood Communications loan us radios so all vehicles can stay in touch during the journey. The team would also like to thank Ora International and Slavic Motricala for their support and help once again with paperwork, translation and border crossings. On site during the months before August, the school had been working hard to change two old classrooms into one room, by knocking down walls, replacing windows and making good, using funds from TEECH. 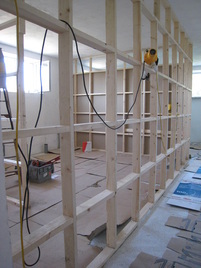 One of the first jobs was for the partition walls to be erected and the holes in the floor to be drilled for the waste pipes. The driliing was no mean feet as the floor are extremely thick! All waste pipes and fittings were donated by Hunter Plastics and the nail gun and nails used to help 'speedily' erect the stud work by Clacton Tool Hire. All the timber for the project was obtained from CF Anderson of Marks Tey, Essex. At the same time work was taking shape outside to install the septic tank and run waste pipe from the first floor of the building. The tank was donated by Mantair of Clacton. Inside the electrical work was well underway. New lighting was being installed in the main hallway outside the project room, as well as lighting for the new bathrooms. 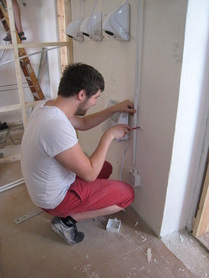 Wiring was also being run for the water heaters and hand driers. Thanks goes to Bonus Electrical for a discount on electrical supplies. 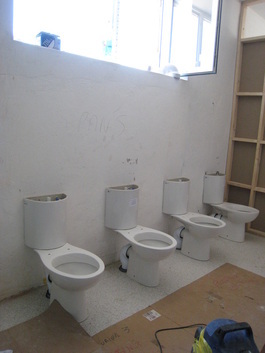 A separate toilet across the hallway was also taking shape for the teachers. This would be one toilet, hot and cold running water, heater and a hand drier. 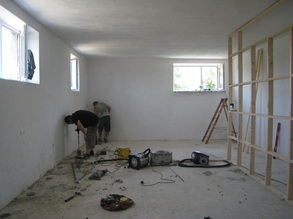 The room required plastering, painting as well as the plumbing and electrical work. These photos show the before and after. 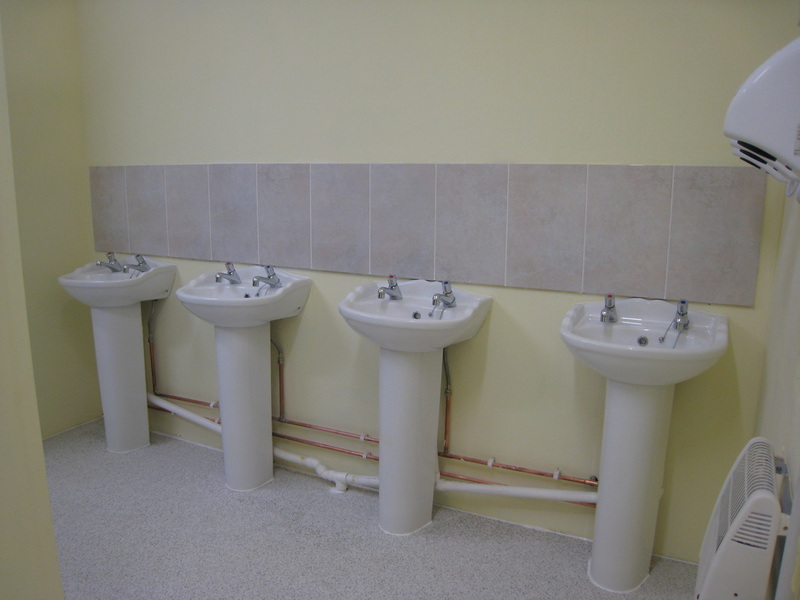 In some schools old toilets exist but these have not been used for many years and the drainage no longer works, therefore any work has to start from scratch. 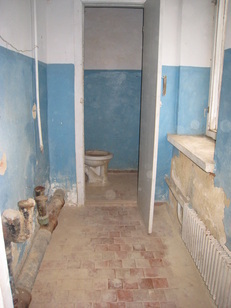 The rooms were really starting to take shape when the toilet partitions were contructed. Suffolk County Council are thanked for allowing TEECH to remove the partitions from a school in Lowestoft which was closing. They now have a very beneficial new home. 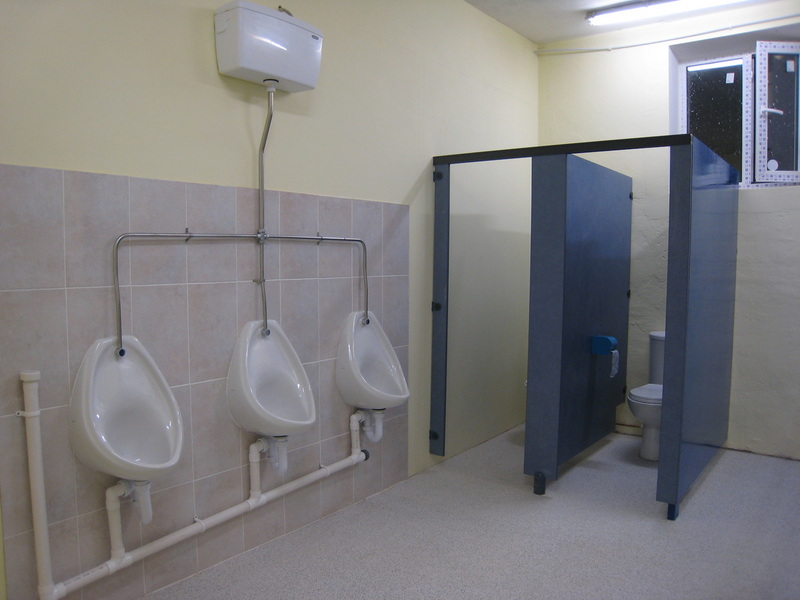 Thanks goes to Danby's for the donation of two shower trays and four showers, including a great discount on the urinals. The lino flooring was once again donated by Altro Ltd which provides the rooms with a nice clean surface. 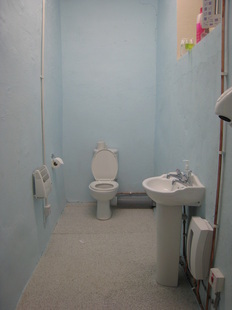 The sanitary ware and tiles were provided by Clacton Bathroom Superstore, with plumbing supplies from Travis Perkins and ﻿Bargain bathrooms﻿ of Basildon along with the pumps from Salamander Pumps and the aqua board for the shower area from the under floor heating company, along with tile adhesive. A huge thank you goes to St James's Place Foundation for funding the cost of the sanitary ware (toilets, urinals, sinks) this year, along with the two boilers and all plumbing supplies. TEECH welcomed the visit from a team from Glaxosmithkline who helped to paint, install the kindergarten septic tank. 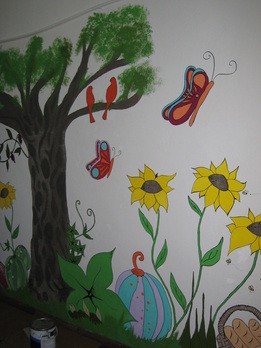 They also donated wallpaper to the school to improve their reception room. TEECH were honored to be joined by Phil Batson the Bristish Ambassador to Moldova and his Embassy team for a day. 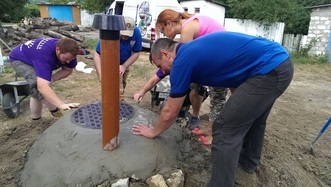 The team got stuck into painting, completing the septic tank work and plumbing. We hope that both teams will join us again for future projects. 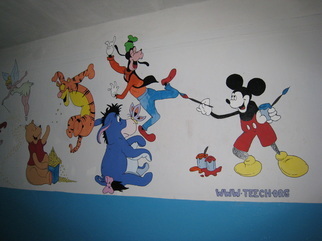 Once again some fantastic art work was produced by volunteers throughout the school. The charity would like to thank Brewers of ﻿Romford for the donation of paint to help produce these creations. 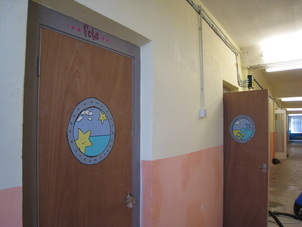 New doors were also installed to each bathroom. The doors were donated by Howdens in Clacton. We would also like to thank John McPherson for working with the team prior to the trip to plan the layout for the bathrooms and complete architectural drawings. Over the year many clothes have been donated from lots of people (many of who we hope are reading this newsletter). We thank you for your donations. We are able to set up a 'free shop' at the school, where those in the village could visit and pick out items they required which worked really well. Gift bag presents from Christchurch, Clacton, Essex were also given to the children who visited the school. Other items donated to the school were lockers from Sprites Primary School and chairs and tables from Springfield Primary both of Ipswich, Suffolk. Bob Parfitt from Wellingborough also donated alot of new trainers, clothing, blankets, crockery and nappies all of which was welcomed by the school and those from the village with huge smiles. A trampoline was taken to the school and as soon as it was put up the children were on it all day (and nearly night!). 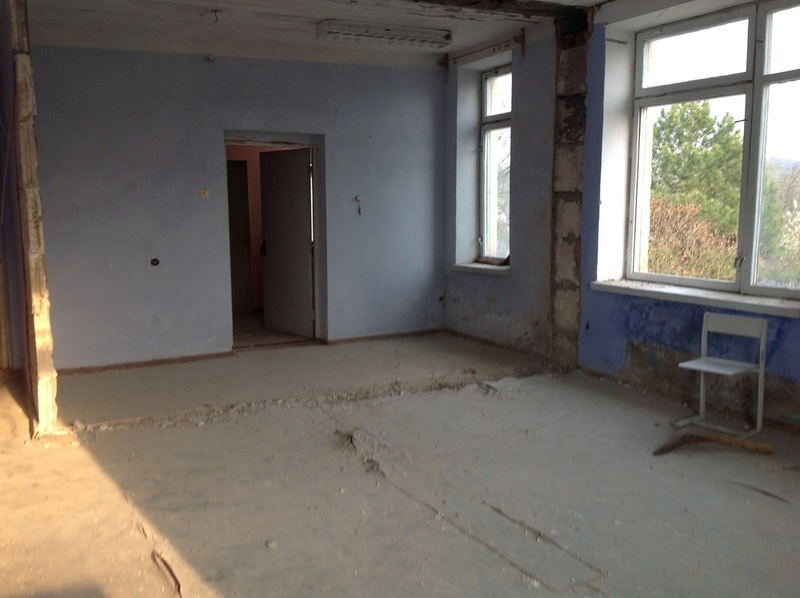 A trampoline was also donated to the kindergarten and one also taken to a neighboring village called Grozesti. We were lucky to be joined by Carol Stadden who is living in Moldova for two years as part of the American Peace Corps. 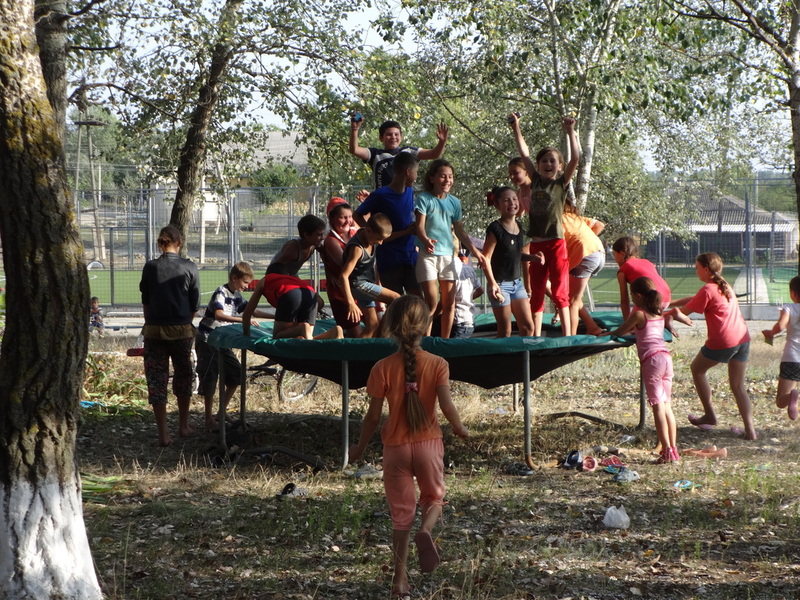 She is living in Grozesti and sent us this picture of the children who a also enjoying a trampoline in her village. Carol worked with the TEECH team helping with the project and translation. And last but certainly not least, TEECH would like to thank Svetlana the school's director (seen below) for making the team feel welcome and working so hard before our arrival to get the school ready for TEECH and also hosting a lovely evening with her and her family to thank us. Thanks also to Svetlana's sisters Larisa and Silvia for helping so brilliantly with translation making our work so much easier. For futher picture of the project please click here. If you would like to contribute with a small amount of cash at any time, then please click on the MyDonate button below to donate online. TEECH hope to once again travel to Romania and Moldova at Christmas, therefore if you would like to contribute to the appeal and complete shoeboxes, then please see the instructions by clicking here. If you are looking to get involved then please let us know so we can gauge how many boxes we may receive and then we can plan who we can help.